Holy hops Batman! The bouquet of fresh tropical fruit is mind-blowing. Pineapple and mango scream in the front with loads of citrus and a touch of pine come along for the hop aroma ride. I get a tiny touch of bread malt but it’s such a wee tiny touch it’s barely noticeable. Beautiful shade of orange amber brown with pristine clarity and a dollop of fluffy off-white head. The tongue turns up more toast and biscuit malts but get neither confused nor concerned the ensuing hop bomb more than justifies the triple india pale ale this beer claims it is. Plenty of mango, pineapple, grapefruit, citrus, and pine blast your tongue with deliciously flavorful and intense bitterness. That bitterness isn’t as powerful as the flavor but there is plenty of it to go around. Medium-lightish weight to the mouthfeel with a smooth carbonation. Surprisingly there is no sense of the 10.1% and I didn’t even realize it was that strong till I got the Sky’s The Limit badge on Untappd for checking into 5 beers over 10%. I don’t know if this is a triple IPA but this has immense hop flavor, solid bitterness, and top marks in all other IPA guidelines. Triple IPA or not it’s a damn good IPA and I can safely recommend it to any hop aficionados and plan to drink it again soon. Thanks for the shout! This was a beast of a beer, but might tasty. Do you like the kung-fu grip IPA glass? Although I have poked a little fun of it on twitter, I used one at someone’s house one time…and I think I kinda liked it. I prefer to think of it as ribbed for my pleasure. Pingback: Continuous Hopping our Kiwi Kaleidoscope | The Mostly Harmless Brewing Co.
Pingback: Beer – #229 – Knee Deep – Simtra Triple IPA | A life just as ordinary. 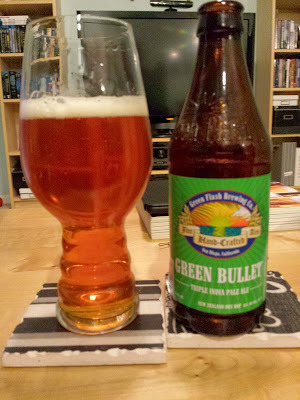 had the quality I’d expect from green flash. I’m struggling to acquire a taste for the New Zealand hops though. I have a hard time describing the aroma/flavor but it’s something like equal parts mildly sour white grapes and pine. I get just a hint of onion on the finish too. Other than the pine it is completely different than American hop aromas. Maybe its just my sense of smell that misses some of the tropical fruit aromas you were getting. Do you think it could be the age (my bottle said best before 4/1/14)? Have you gone back to this beer? Did you take to NZ hops right away? I’m curious to hear your thoughts. I don’t’ recall how fresh the bottle I had was but I don’t fully buy into all the super fresh stuff. Yes, within the first week there is a difference for most brews after that it stabilizes for quite a few months. I have not gone back to this beer yet but keep planning too. This is the first beer I can recall that specifically mentioned NZ hops, so I guess I’d say yes. I did take to them right away lol.